According to POST (California’s Commission on Peace Officer Standards and Training), California law enforcement are injured in roughly 700 automobile collisions each year. Conventional wisdom holds that it is younger officers who get into the most high-speed pursuit accidents, either because of inexperience, poor judgement, poor control of their emotions, or a combination of all three. But is this true? Are Younger Officers Worse at High-Speed Pursuit Driving? While we now have a better understanding of what policies, training, and equipment can reduce officer injuries and deaths due to assault, research into officer vehicle collisions is scant. That said, most current research indicates that age does not seem to be a primary factor. Neither the oldest nor youngest officers form the bulk of those killed in the line of duty during high-speed pursuit or in another traffic-related incidents. But which is the greater factor in saving lives: Training or experience? After all, we have some indications that more experienced officers are more desensitized to how fast they’re driving. How can we train proper “experience” without desensitizing officers? 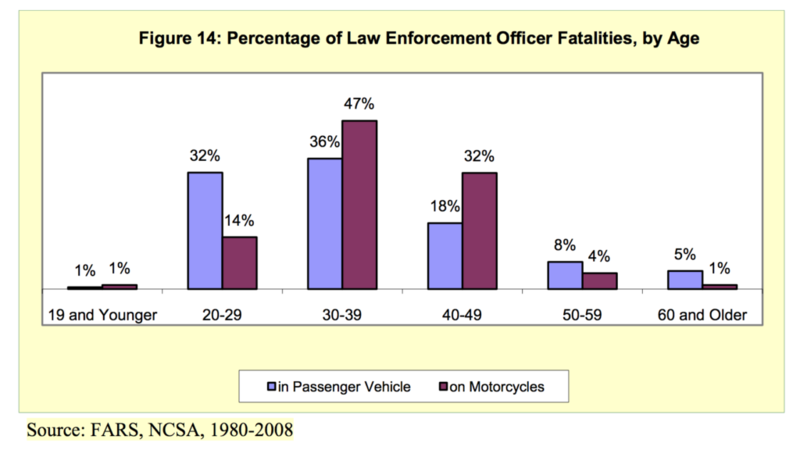 Note that POST, NHTSA, and Wolfe all found that officers 30–39 years old were the most likely to be injured or killed in a crash. POST further found, upon more detailed analysis, that while for some periods it was California’s less experienced officers who crashed, that was not always the case. For example, in the 1990s POST found that roughly 70 percent of the officers killed in car crashes had less than five years’ experience. But in the early 2000s, the average officer killed in a crash had 12 years of experience—almost twice as much road time. POST’s data on the impact of training is less equivocal. According to POST, we can expect 52 percent of all officers to get into a collision. But of those officers who receive any additional driver training after leaving the academy, just 47 percent are in an accident. Five percentage points might seem like a small reduction, but represents hundreds of sworn officers spared injury—and possibly death—each year. This tends to imply that the solution is not just a matter of improving our approach to high-speed pursuit training programs. We also need to spend more time training and retraining our most experienced drivers.